One of my most fun times in the Mayan Riviera was an early morning Akumal Bay Turtle Snorkel. To get to Akumal Bay Turtle Snorkel from the Gran Bahia Principe Tulum wasn’t too hard at all. 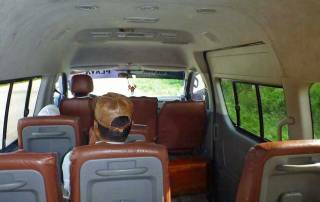 First I took the hotel tram to the highway, because I was determined to experience a colectivo – a Mexican shuttle bus. A colectivo was sitting at the hotel when we arrived. The driver honked to indicate we should get a move on if we wanted to catch it. He didn’t speak any English. I indicated Playa Akumal and he said 20 pesos per person. I paid and off we went. 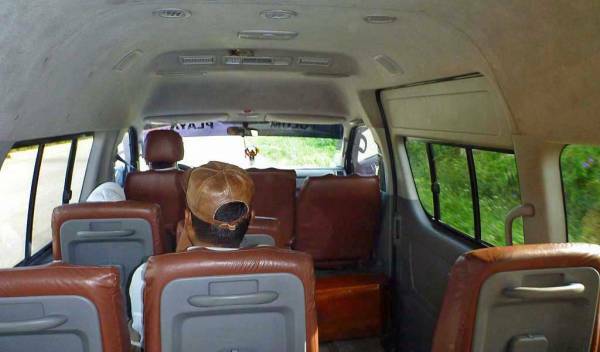 We were the only non Mexicans in the van. Everyone else paid when they left whereas I paid when I got on. The ride was over in less than 10 minutes. The driver explained in Spanish how to get to the beach from the highway. 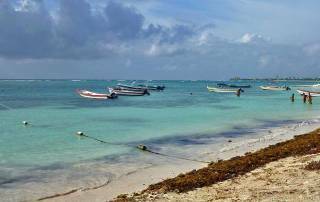 It was a fun adventure to get to the Akumal Bay Turtle Snorkel. Akumal Bay was very calm, which was good news because the Gran Bahia Principe Tulum was closed to snorkeling due to the wind. I could see several places where there were snorkelers, but I wasn’t sure where to begin. A man on shore offered to take me in a boat for $25 per person, but only if someone else joined in too. So I went to the Akumal Dive Center, where I rented snorkel gear for $18. 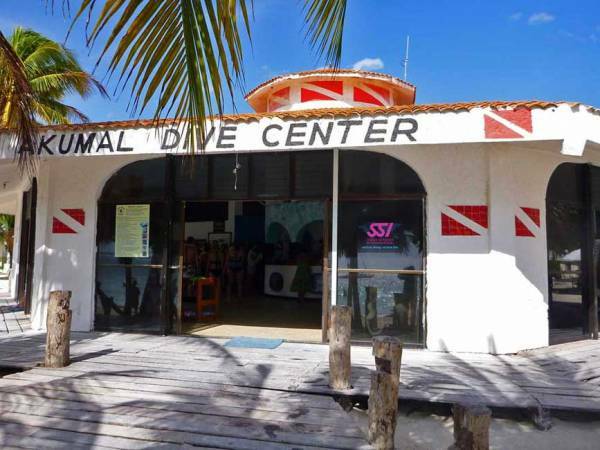 The Akumal Dive Center is the beach, directly in front of the Akumal Bay Turtle Snorkel spot. 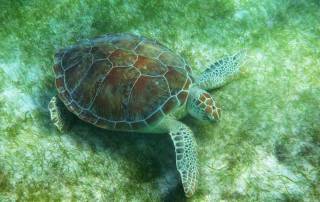 The staff at the Akumal Dive Center said it would be easy to swim out to the Akumal Bay Turtle Snorkel by myself. The timing was perfect because the daily tourist groups hadn’t arrived yet. I swam straight out into the bay toward other snorkelers. Soon I swam over a couple green sea turtles in about 6 – 8 feet of water. 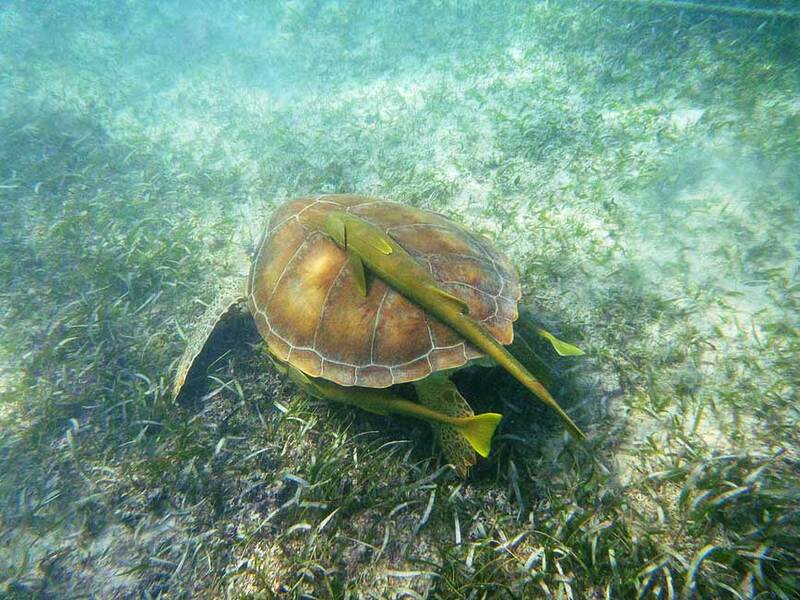 Some of the Akumal Bay green sea turtles had remora attached, which gave them a strange appearance. 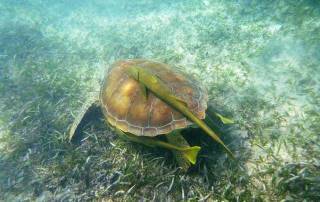 The green seaturtles were about 3.5 – 4 feet long and they were busy munching the weeds on the sea floor. They paid little attention to me as I swam over top of them. 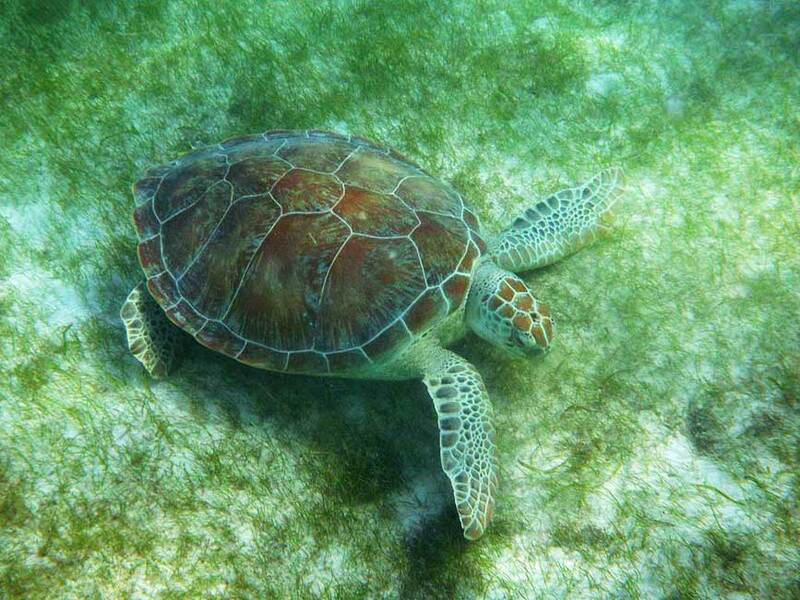 A little further on, I saw two more Akumal Bay Green Sea Turtles. Then I realized that if I went any further, a boat full of tourists had arrived and I’d soon be among them. So, I returned to the turtles nearer the shore for one more good view. 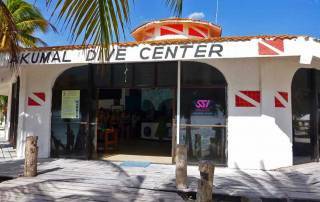 Then I happily returned to the Akumal Dive Center for a shower and a change of clothes. Next it was off to catch the colectivo in the other direction. This time I played the veteran traveler – no questions on price and no offer to pay up front. When my stop was called I handed some pesos and the driver grunted his acceptance. The unusual part of the experience is when you arrive back at the hotel, there’s no over pass or crossing on the 4 lane highway. You are simply expected to run across the coast highway to reach your hotel. As I bolted through the traffic, others are running toward me to catch the same colectivo. 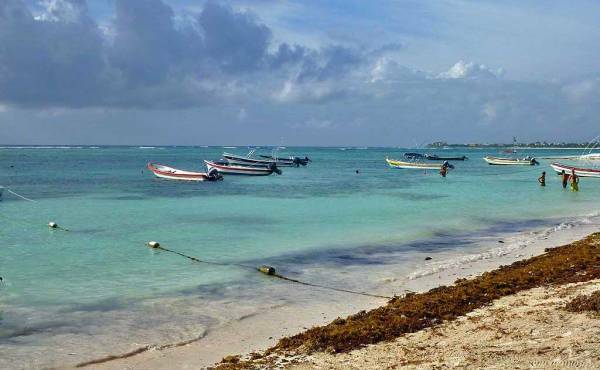 My Akumal Bay Turtle Snorkel was a truly Mexican experience!